Two of the principle characters from my Diorama of Doom IV WIP. 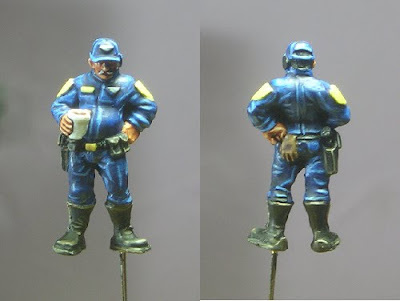 This is Bob, the older supervisor of the 'crew' complete with polystyrene cup of tea and a nonchalant 'seen it all' world-weary look, surveying the latest mishap of his more junior colleague Dave. He thought he'd seen it all, he keeps his tea hot and his gloves clean as he tries to keep his young enthusiastic, energetic staff out of trouble. He ignores the health and safety regulations and refuses to wear his hi-vis jacket. And this is Young Dave, otherwise known as "Dave down the pub", the guy who waxes lyrical on all manner of subjects but has no common sense. Nothing is EVER Dave's fault! He wears his high vis jacket with pride as Bob told him it was a chick magnet but he's cut the sleeves off his company coverall to avoid looking like a gimp in a suit (like Bob). In the Diorama Dave and Bob are discussing Dave's latest 'incident' and surveying the consequences. It is Dave questioning his boss Bob with the line after which this diorama is named. "Do you think he'll notice?" Great Heresy sculpts and highly recommended. a joy to paint. 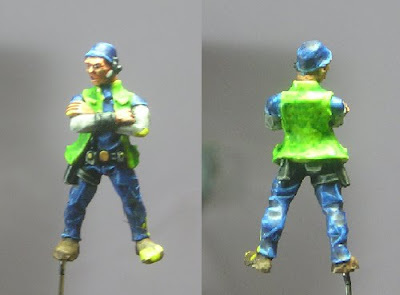 The high vis jacket is a challenge - its actually painted with fluorescent yellow paint and shaded with GW Thakka Green wash. I'm not entirely sure it works, but it is bright! I still have a few details to paint - Bob's hair, Dave's wrist strap and both their ear pieces. Plus a bit of touch up here and there. Better pictures will be taken when they are complete. Nice work on those two! As for the vest, I doubt you'll be able to get it much better than it is so I wouldn't change it if I were you. Focus on the other stuff instead. This little DoD is looking better ans better...now all you have to do is make sure you finish it ;).